Fall weather is in full force and we’re feeling so inspired by the deep colors of the season. The experience of the outdoors, the amazing weather, and the beautiful sights have in turn converted into an obsession with the feeling of sophisticated, natural earthiness. 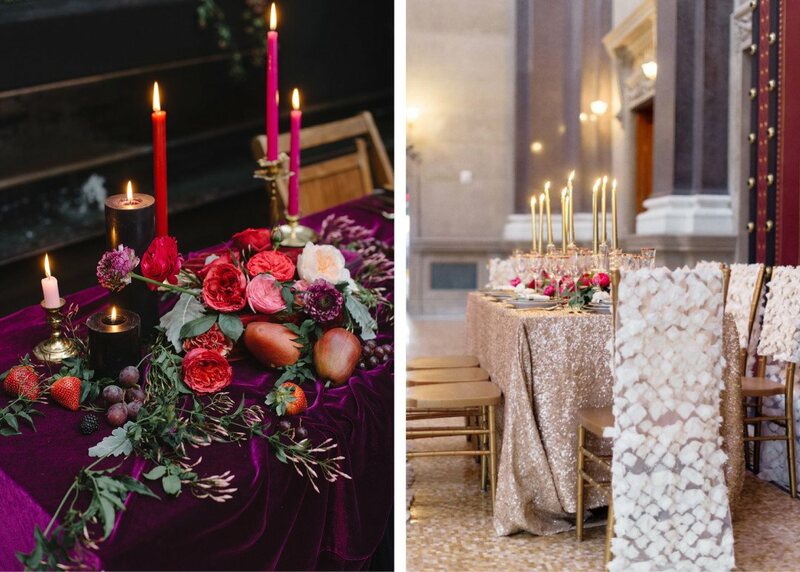 That’s why this week we’ve decided to focus on how to bring that feeling by incorporating Marsala – the 2015 Pantone Color of the Year – as an accent color or hue to your next wedding or event design. 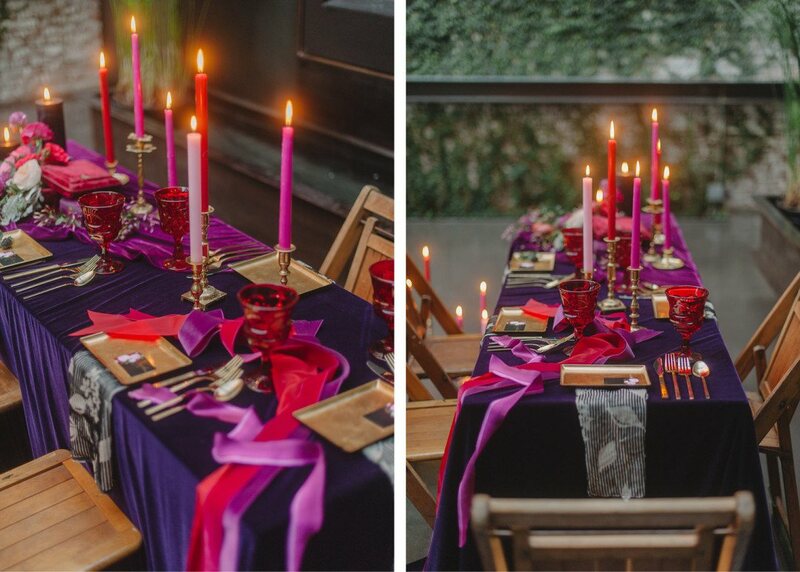 Marsala is a bold yet dynamic color, so there’s no right or wrong as to how you can use it in an event. 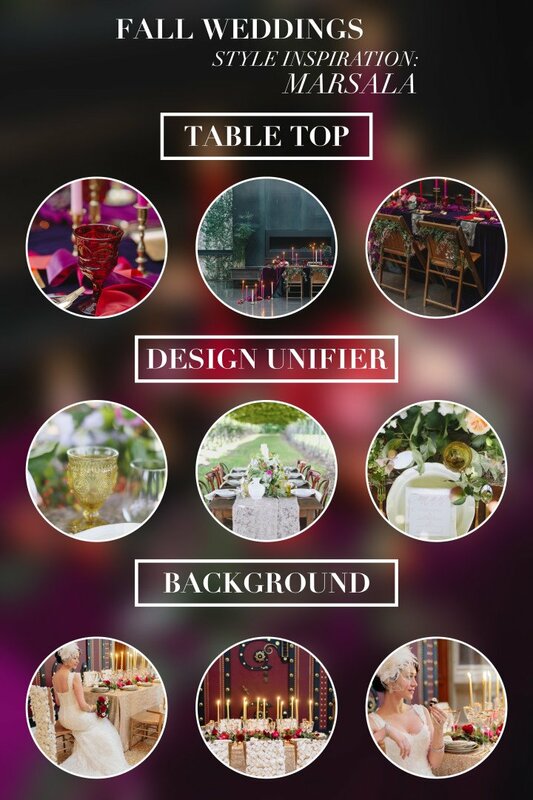 Whether you use Marsala as an accent on your tabletop design, as the unifying color that ties everything together, or as a more neutral and background element to the table, you can make it work while evoking different emotions to your guests. The impactful and full-bodied qualities of Marsala make for an elegant, grounded statement color when used primarily on its own or as a strong accent to other complementary and contrasting colors. This tasteful hue embodies the satisfying richness of a fulfilling meal while its grounding red-brown roots emanate a level of organic sophistication. If you’re thinking Marsala-theme, you’re probably thinking Marsala table top, but what to do to make sure it looks great and brings that seasonal feeling to your guests? The key here is in the contrasting accents. You can choose one complimentary and one contrasting color and use different elements of each. 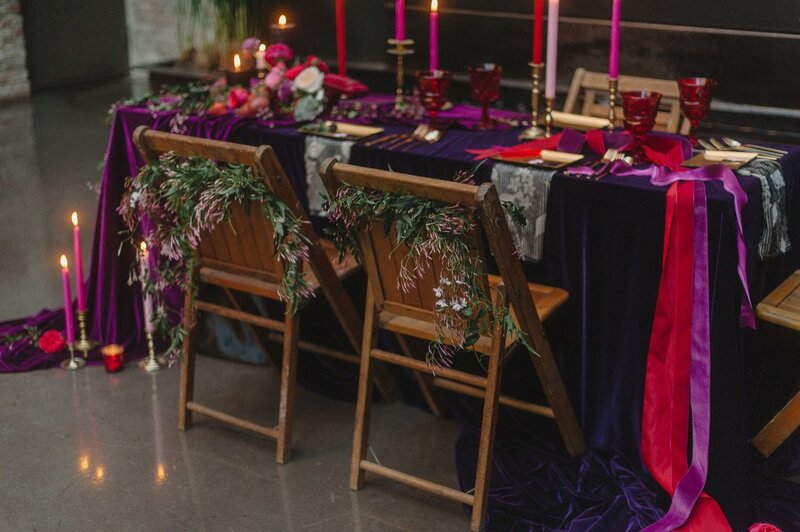 For instance, in this particular setup we used our Purple Velvet and Plum Velvet linens from our Elegance Collection as a complimentary color to the Marsala-accented baroque glasses and the various red-shaded laces, flowers, and candles. 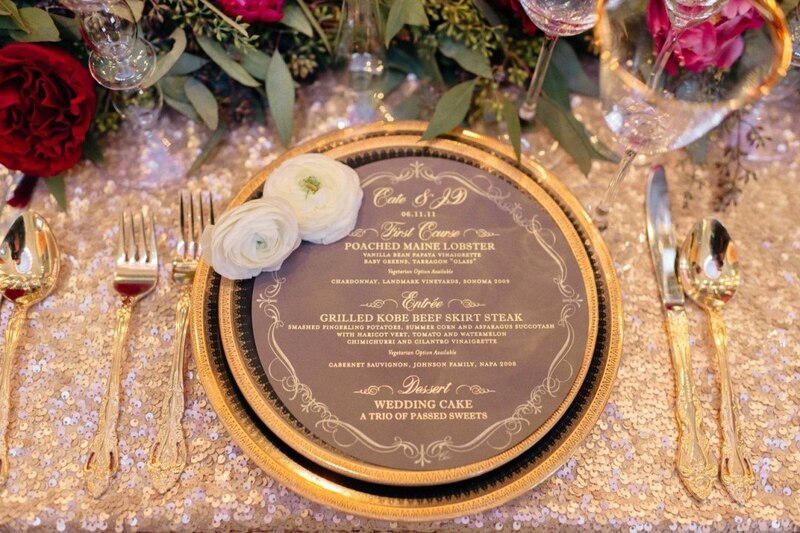 As a contrast, we incorporated some golden elements such as the silverware, plates, and candle holders. While the colors can be interchangeable, try to find the balance between the different elements. 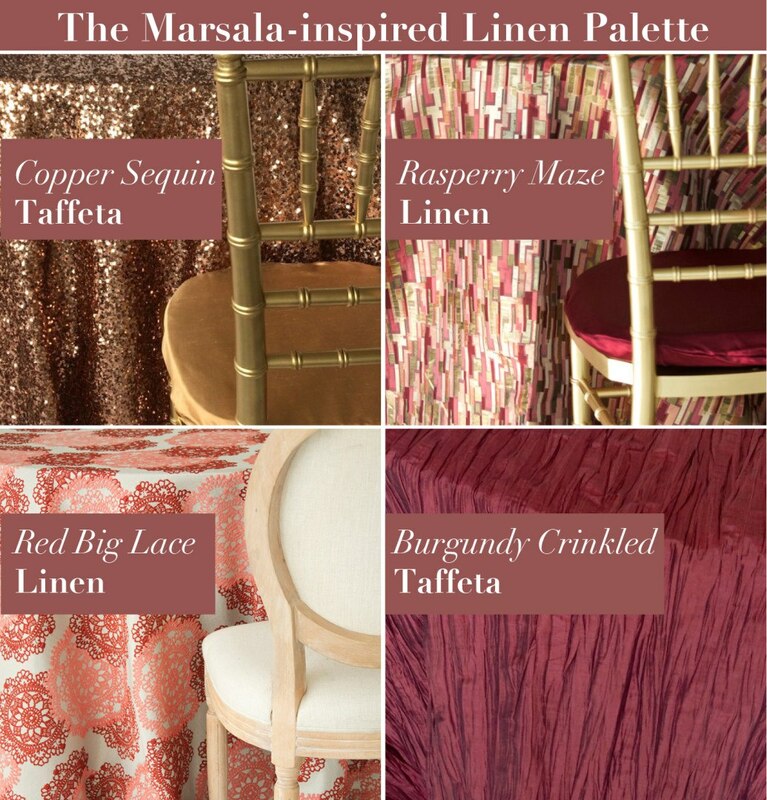 And if you want to go with a Marsala tabletop, make sure to check out our Marsala-inspired linen palette below. Finally, to neutralize the palette, we intentionally set up right next to a green vine on a brick wall. 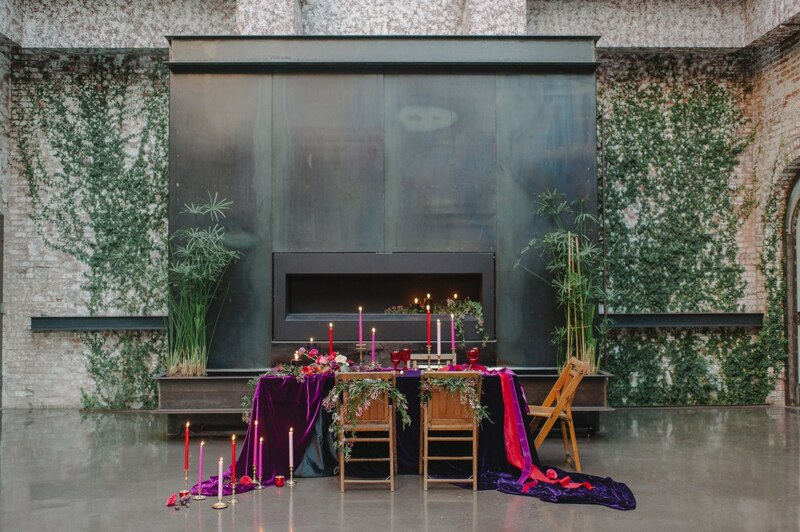 If you’re trying to play with a more baroque look on an industrial space, this could be the perfect look! 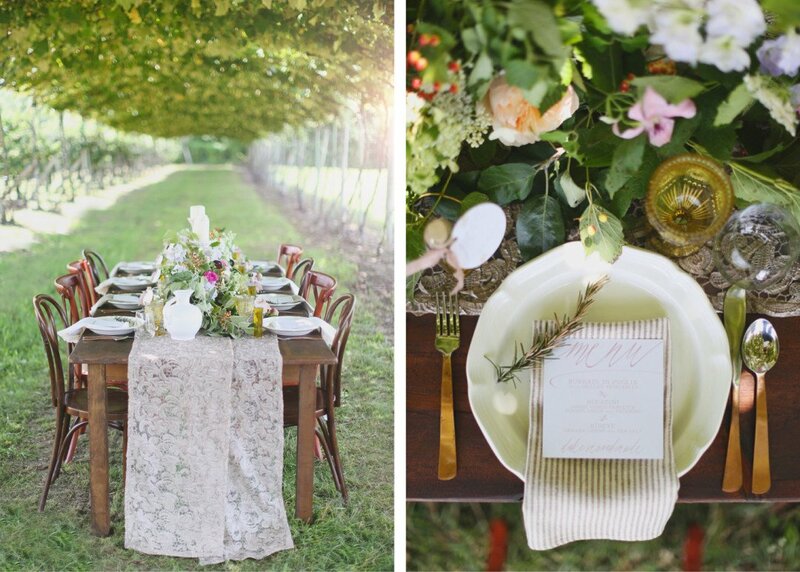 For those who love the outdoors, but are looking for that sophisticated, natural earthy look– this casual, farm-to-table style will be the perfect one to host your guests for those daytime weddings and parties that extend towards late night gatherings with friends. Here, we make use of a reddish-brown toned wooden table to get the Marsala as the foundation color and then keep a naked look with accents that will create contrast while setting a more earthy and grounded atmosphere that people can relate to. 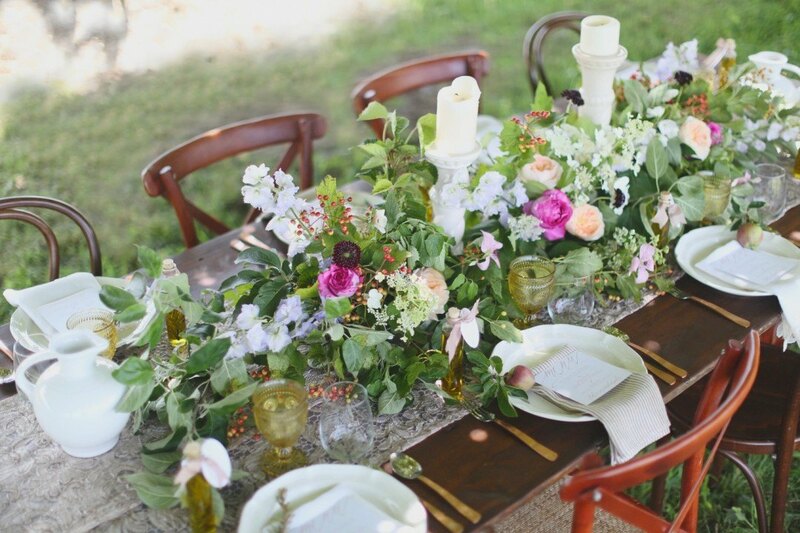 Our Taupe Victorian Lace Runner runs through the axis of the table, dropping on both sides and serving as a boundary for the boho-style flower arrangements, rusted yellow vintage glasses, and a few other intricate details. We then have white plates with copper and silver-lined silverware overlapping and blurring the boundary between runner and naked table. 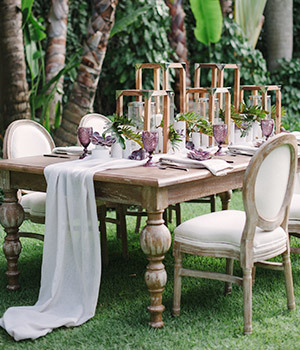 Finally, setting the table in the middle of a (well-shaded) outdoor area with tons of greenery will make the arrangement magical and dreamy and will ensure to be a lifetime memory for your friends and guests. 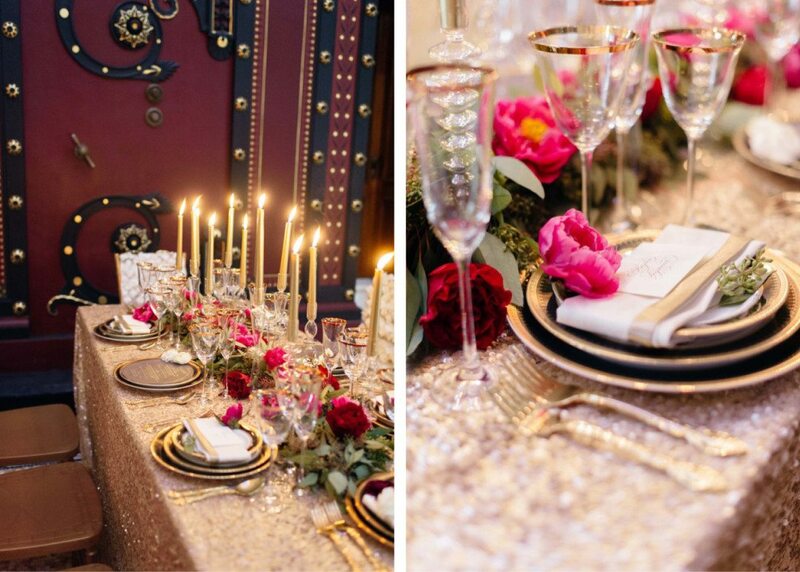 If you want to channel your inner Gatsby and let it loose, this 1920’s-styled table provides an ornate and lavish atmosphere, perfect for a formal gala or tuxedo required event. 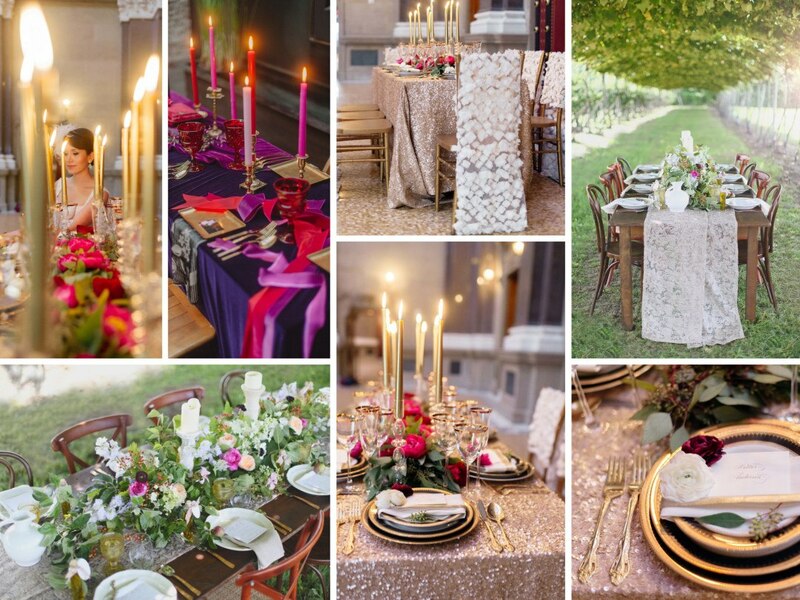 The sparkly, Champagne Sequin Taffeta provides a clear contrast with the Marsala and black background on the walls, yet the delicate and light lavish arrangement certainly tones down and provides a more lively space for guests to engage in conversation, meeting new people and creating new connections with each other. 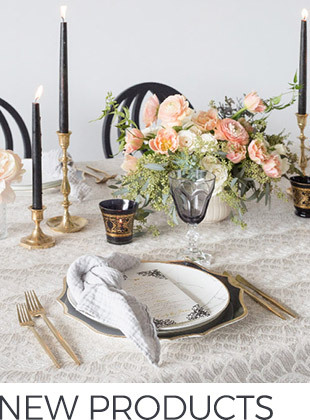 Simple and classy, this particular design incorporates champagne and gold-colored silverware, glasses and candles to go along the bright Taffeta linen, while the backdrop and the flowers provide a delicate and elegant contrast. To a beautiful Fall wedding season! This entry was posted in Nuage Guide, Press Release, Style. Bookmark the permalink.